What is Blue Shield Easy$Pay℠ and how can I sign up for it? Easy$Pay is the easiest way to pay your bill. You can set up automatic payments through your checking or savings account. 1. If your bill looks like this image, follow these steps to set up your automatic payments. a) Go to blueshieldca.com and Log In or Register for your online account using your member ID number. b) Once logged in, hover over the My Plan & Claims tab, and click Payment Center. c) This will bring you to the Billing dashboard. d) Click Enroll in Automated Billing. e) This will bring you to the Billing Account Vault screen. eBill: Choose this option to receive monthly statements via electronic delivery instead of paper, or to cancel Easy$Pay and receive a monthly statement via electronic delivery. Automated Billing (Easy$Pay): Choose this option to set up Easy$Pay. Paper: Choose this option to either cancel electronic delivery of your statements, or to cancel Easy$Pay and begin receiving monthly bills in the mail. g) After selecting Automated Billing, click on Create a New Account. Enter all checking or savings account information and click Create. h) You are now enrolled in Easy$Pay, and it will be effective within one to two billing cycles. 2. If your bill looks like this image, follow these steps to set up your automatic payments. b) Once logged in, locate and hover over the My Plan & Claims tab and click Payment Center. c) This will bring you to the Pay My Premium screen. d) Click Set Up Auto-Pay located in the Quick Links section on the right-hand side. e) Enter your checking or savings account information and click Activate Auto-Pay. What immediate action do I need to take if I am affected by the transition? What do I need to do if I pay my bill with Easy$Pay? What do I need to do if I pay my bill with one-time or scheduled payments online or by phone? Can I see a simplified chart of all the dates I need to be aware of during the transition? What happens if I try to submit an online payment during the transition? Will there be any changes to my paper bill? Will there be any changes if I pay through my bank or financial institution? Will there be any changes if I pay my bill by check? Will there be any changes if I make payments by phone? How do I set up my Wallet in the new system? How do I make a one-time online payment? How do I enroll or re-enroll in Easy$Pay after the transition? How do I make an update to my Easy$Pay automatic payments? How do I cancel my Easy$Pay automatic payments? Who should I contact if I have questions or issues with our new system? As of January 1, 2018, Blue Shield no longer offers the option to make a payment on the 15th of the month. This change will affect some of your clients during open enrollment. As we previously informed you, new off-exchange enrollees will not have the 15th of the month payment option in their enrollment materials. In addition, the automatic payment option through Easy$PaySM will be temporarily unavailable until later in 2018. Your post-ACA Blue Shield clients who currently make payments on the 15th of the month will be moved to a 1st of the month payment date starting January 1, 2018. A majority of those members are currently on Easy$Pay (see letter #1 below) and we need your help to ensure your impacted clients take the appropriate actions to keep their accounts current. Log in at blueshieldca.com and go to Billing & Payments to set up recurring payments with Easy$Pay. Save payment preferences in the online “Wallet” tab of the payment center. 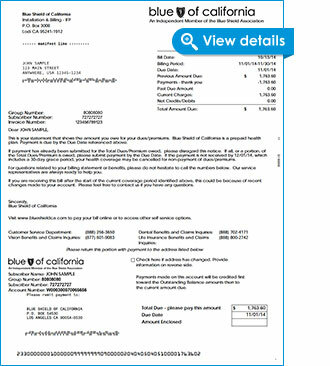 Blue Shield of California is updating our online payment system, which affects approximately 45,000 Individual and Family Plan members and 99,000 Medicare Supplement members. Please read below to find out what actions members need to take to continue making timely payments during the transition to the new system. Members who are affected by this transition will receive notifications from Blue Shield in the coming days. In preparation for this transition, it is important that members whose bill is due on the 1st of the month make their payments for their April bill by March 30. If their bill is due on the 15th of the month, they need to make their payments for their April bill by April 15. The payment system will be unavailable from Friday, March 31 to Monday morning, April 3, and we are unable to accept or process online payments or payments by phone during this time. There is no impact to members who pay by check or through their bank or financial institution. They can continue to pay their bill as usual. There are no changes to their monthly bill. We will process their automatic payment on March 30 to pay their April bill. To ensure that the payment for their May bill will be automatically deducted, they need to re-enroll in Easy$Pay and establish their payment preferences between April 3 and April 9. After April 9, they will need to make a one-time payment for their May bill by May 1, and then sign-up for Easy$Pay by May 9 to pay their June bill. We will process their automatic payment on March 15 to pay their March bill. Members will need to make a one-time payment for their bill that is due April 15. To ensure their payment for their next bill will be automatically deducted, they need to re-enroll in Easy$Pay by April 23. In preparation for this transition, it is important that members make their payments for their April bill by March 30 if their bill is due on the 1st of the month, and April 15 if their bill is due on the 15th of the month. Log in to the current payment system prior to March 30 and change the date their payment is scheduled. Send a check to pay their April bill. Members can log in to the new system beginning April 3 to schedule a new payment for their next bill. These members can continue to call the customer service phone number on the back of their Blue Shield member ID card to pay their bill. No payments can be processed from Friday, March 31 to Monday morning, April 3. Members who were using Easy$PaySM, our automatic payment system, need to take action to re-enroll in the new system to ensure their monthly payments continue to be withdrawn. You have clients who may not have taken action yet and could be late paying their premium. Your impacted clients need to act now. To help your clients find instructions about how to re-enroll with Easy$Pay online, please see our frequently asked questions. Medicare Supplement members can also use the Easy$Pay form to re-enroll in Easy$Pay. Later this week we will begin sending reminders to members about making their May payment and setting up their Easy$Pay account. For IFP members: All grace periods, delinquency and termination rules remain in effect with regards to this system change. For Medicare Supplement members: Those whose payments are late because they didn’t re-enroll in Easy$Pay will NOT be disenrolled. We appreciate your partnership and patience as we work through these changes to provide a better payment experience for your clients. How do I change – update my credit card information? Here’s the answer on Blue Shield’s FAQ Page. 1. Click View Payment Center under “Monthly Premium” or select Billing and Payments from the blue navigation bar at the top of your screen. 2. This will bring you to the Billing & Payments screen. 3. Under “What would you like to do?,” click Set up or modify auto payment. 4. This will take you to the Easy$Pay screen where you will find the accounts you have set up for auto payment. Select Update. 5. On the next screen, change the start or end date, payment account or email address. Then click Save. 6. A confirmation screen will appear, and you will receive a confirmation email. Your Easy$Pay account has now been updated. If you would like us to do it for you, please complete this form and return to us. There is no extra charge for our service. Blue Shield pays us.